18.8 mm heavy joint connector for 18.8 mm bowls and 18.8 mm bongs. 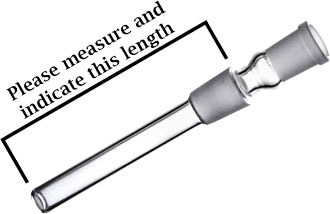 The length of connector is measured from the top edge of each cut to the lower end of the downpipe. Please enter the determined length in the comments field you will find at the end of the ordering process. We then cut the connector exactly to the specified length . Length of coupling up to 19,5 cm.